Finding the falls. And Nirvana. 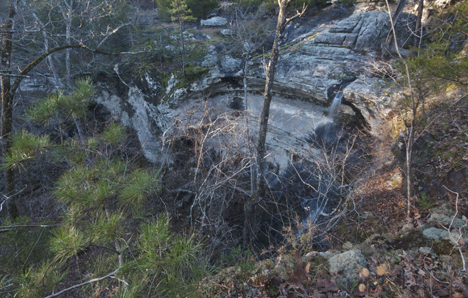 Three Springs Falls in Baxter County, Arkansas drops 45 feet from here to the canyon floor. Above this drop, there is an additional 14 foot drop. 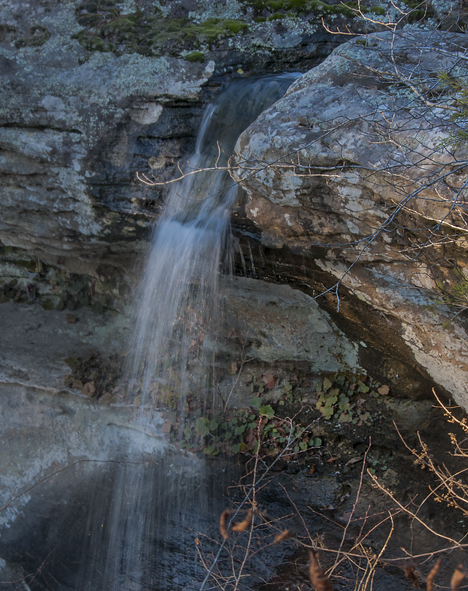 Thanksgiving, I was at Mountain View Arkansas, a mere thirty miles or so from Three Springs Falls, a location well ensconced on my waterfall hit list. Waterfalls seriously tug at my innards, which is home folks speak for what some people call the “inner-self,” or other allegedly enlightened terms for how you feel under certain circumstances. Innards works fine for me. And being in the presence of a good waterfall is near Nirvana for yours truly. My wife and I had joined the rest of her family for the annual feast, this year, at Mountain View, which put me far too close to resist my nagging waterfall proclivities. At the conclusion of a fine and enjoyable family Thanksgiving repast at the Skillet Restaurant at the Ozark Folk Center, I excused myself, donned my well-worn Carhartt coveralls, hopped in the truck and headed toward the siren song of the falls. You can see three other pictures of the falls and area around the falls on the Photo of the Week page at Corndancer dot-com where this story started. Three Springs Falls descends through a huge and spectacular rock formation to a large canyon. You can see much more of the formations since the deciduous tree leaves have now dropped. Though the falls were not as large and impressive as they can be, just being in the neighborhood has its aesthetic benefits. The trees, rock formations and general lay of the land are enough to keep a curious person looking for hours. The feeder stream for the falls runs through some well worn channels in the rocks and for a short stretch, under a cedar roof. 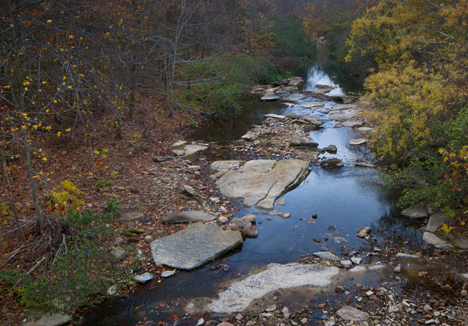 The feeder stream for Three Springs Falls runs through a well-worn channel in some big rocks. 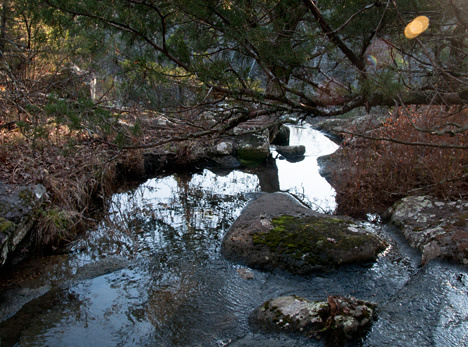 Here a cedar branch stretches across the stream. Late evening sun added lens flares. The trip out and the trip in offer different views. Since this is not a tactical environment, one can go out the same way he came in without fear of ambush. As a result, you discover what you missed on the way in. In this case, a couple of trees, one a hardy green cedar and the other, a leafless deciduous tree seem to be growing in concert. The angles of trunk and foliage seem to be synchronized. This is mother nature doing one of her finest tricks. When I shot the tree, little did I know that I was getting three pictures in one. The picture below is the middle of three. See the other two in our Weekly Grist gallery. 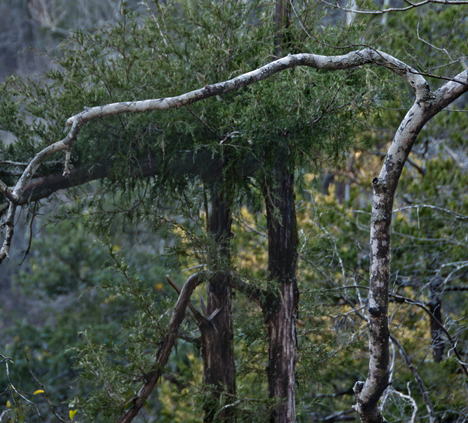 These trees I saw on the way out from the falls seem to be synchronized. 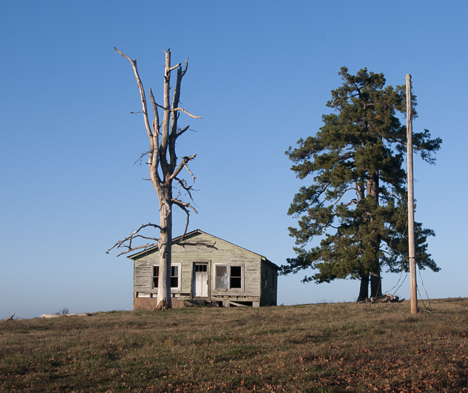 The day before, when I was reconnoitering the area, I happened across a house on a hill, an always intriguing sight. The day was overcast and gloomy, but I shot it anyway. After I completed my visit to the falls, the sun was low but hitting on all cylinders so I headed the few miles to the house for a second look. This time the light was fine. I actually have three versions of this shot, you are seeing the third below. The others are the original and the golden sunlight version of this one. See them in our Weekly Grist gallery. A house on a hill is always a welcome sight. Makes one wonder why the domicile was abandoned. Having had a nice visit to a waterfall neighborhood, I left and headed back to my family well recharged. As an end to a near-perfect day, we, as a family, attended a traditional southern Ozark Gospel “singin” at the Ozark Folk Center. The performances were the real thing and very enjoyable. Reflecting on the waterfall visit, I believe judicious exposure to the uncompromising, unyielding, and harsh reality of nature provides blessed relief from the artificially inseminated, politically correct, pseudo-reality we face on a daily basis. It’s hard to argue with a big rock. See all of this week’s pictures larger and better in our Weekly Grist gallery. 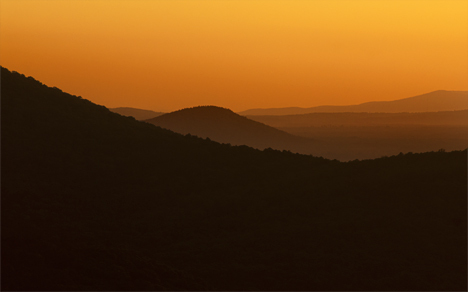 Looking west from a Petit Jean Mountain overlook late in the afternoon in October of 2008. A few minutes before the view was too bright, a few minutes later, it was too dark. The picture was squirreled away in my archives. A question from my wife stirred up a photo search and this is one of my unintended discoveries as I looked. Shot October 2008. Click on the lightning to see how the story started. A question from my wife regarding the identity of a tree in our neighbor’s yard sent me on a trip through the archives. After identifying the tree as one of the “hicker nut,” (hickory to the uninitiated), persuasion, I began a search of my archives to find a particular picture of the tree. I found the picture I wanted: the tree in its bright yellow fall plumage. As a bonus, I also found a picture of a lightning strike with the tree in the foreground — and a number of other shots I previously overlooked — some of which I decided were ready to be shown. So this week, we are wandering through the archives. See the first three pictures in the search on the Photo of the Week page at Corndancer dot com. You will see the yellow tree, the lightning strike and a companion picture to the one above — and below. 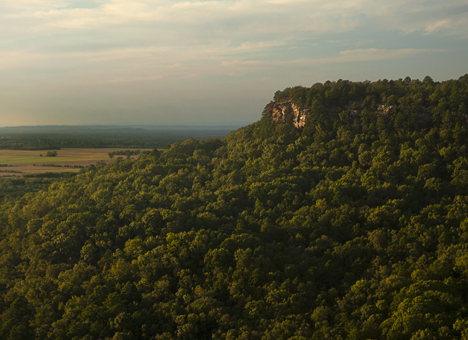 Looking north from the lodge observation area at Petit Jean State Park, near Morrilton, Arkansas. The sun is beginning to set. I shot the picture you see at the top of the page from an observation area near the bluffs you see above. I shot both pictures in October of 2008. Around 30 minutes or so northeast of Petit Jean Mountain is Scotland, Arkansas. There is an old home place there, right on the main drag, sporting an old barn and a house with a dug well in a well shed. When I was in that neighborhood in 2008, I found a unique home place in the boondocks nearby and featured it that week, to the expense of the place in town. Now I am righting that wrong. The well shed is below. See the house in our Weekly Grist Gallery. 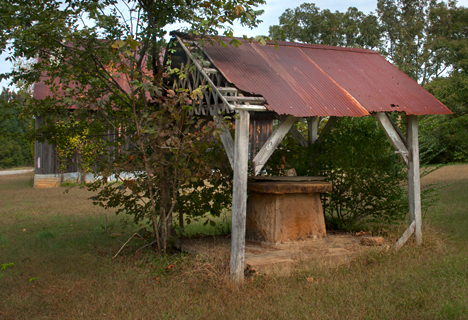 This dug well and shed are part of an old home place right on Arkansas Highway 95 in Scotland, Arkansas. It is not necessary to leave your vehicle to see it. The family barn is in the background. Shot October 2008. A bit closer to home, just south of Scott, Arkansas on Arkansas Highway 161 is a favorite target of area photographers: A pecan tree tunnel. I like the fall shots best when most of the leaves have dropped and you see the character of the trees. But then, that’s just me. 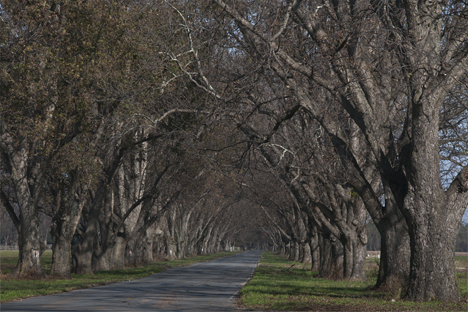 Pecan tree tunnel south of Scott, Arkansas on Arkansas Highway 161. November 2009. This is not the first time I’ve shot these trees, but this is the first time for this particular picture. See the previous visit, “A tunnel of trees.” The shots are from about the same place as this one in the evening and the next morning. This sailor is pulling crew duty as he watches the proceedings of the 2005 New Orleans French Quarter Fest to his immediate front. 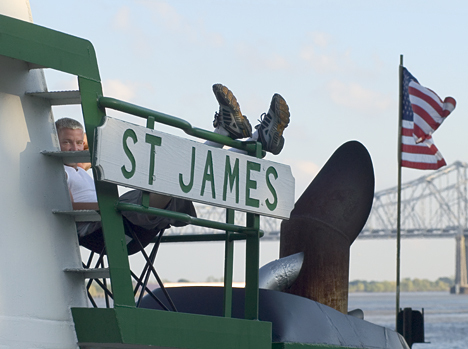 And finally, way further down south, a crew member of the St. James, a tug boat docked at a jetty on the Mississippi River in New Orleans eyeballed me just as I made this shot. I nodded to him and he nodded approval to me. Just to his front is Waldenberg Park where a big part of the 2005 French Quarter Fest activities are taking place. See some flowers, the old house next to the well shed, an old structure that I can’t figure out — old school or old church — which is it? A common place sight that made an uncommon reflection, and a couple of other late evening sunset shots. Thanks for joining me in a trip through the archives. A '54 Oldsmobile 88 leads a stationary parade of old cars. The second in line appears to be a '59 Ford. The third car is anybody's guess. The cars are in a "used" car lot on Arkansas HIghway 16 west of Heber Springs, Arkansas. I started out on a fall color trip and found plenty of colors on Arkansas Highway 16 in the central Ozark Mountains — and more than I bargained for. I found rust and ruination, old barns and more. The story of this trip actually started on the Photo of the Week page at Corndancer dot-com where I found an old corn crib about to fall down across the highway from this old car. Take at look the corn-crib picture and a couple of others, we’ll wait here until you get back. 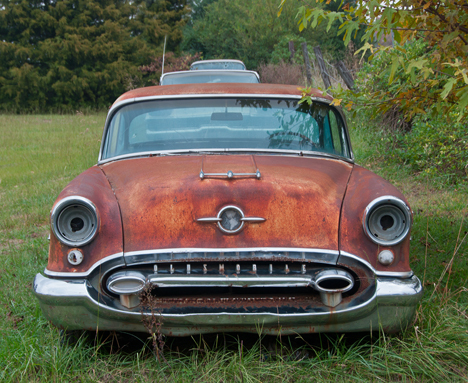 The old Olds deserved a close-up portrait to properly reveal what's left of its former glory. These models could burn some serious rubber. 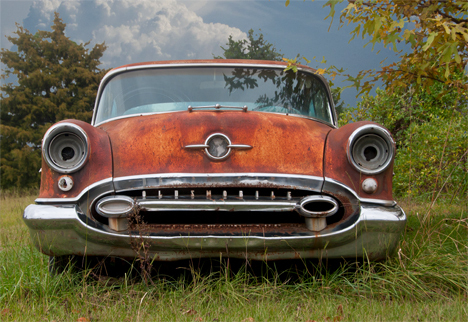 What was once a cool ride now reminds you of the guy down the street with snaggle teeth and a dirty shirt. 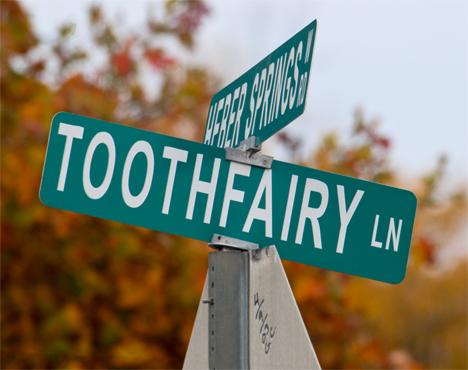 The old Olds and a number of other mostly fifties vintage automobiles are stored in a lot at the corner of, get ready for this, “Toothfairy Lane” and Heber Springs Road (Arkansas Highway 16). That’s right up there with “Mad Dog Hill Lane,” about 60 miles or so to the east of this location, which I have photographed twice . (You’ll need to scroll down at both link locations). This is not contrived. 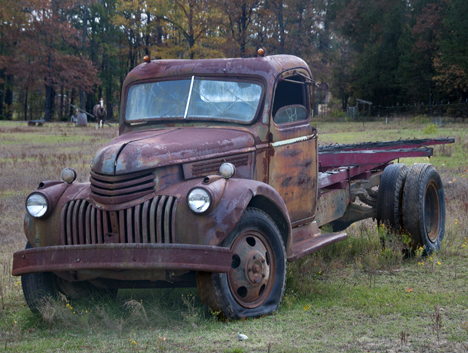 The old cars in a lot at Toothfairy Lane and Heber Springs Road, a.k.a. Arkansas Highway 16. See all 16 pictures from this trip in a larger format in our Weekly Grist Gallery. Highway 16 winds through a lot of sparsely populated countryside which ain’t a bad deal if you are looking for some serenity as you travel — and you never know quite what to expect. 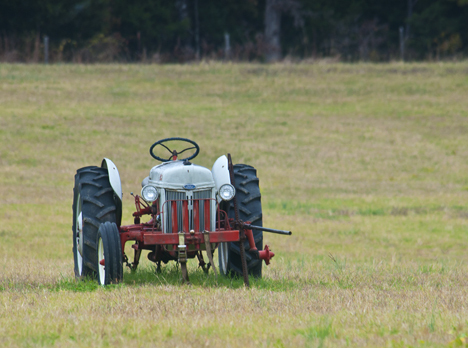 I came across a huge pasture in the midst of which was an old Ford 9N tractor sitting on three wheels and a jack. I’m thinking the local parts house does not stock a lot of Ford 9N tractor stuff. The forlorn old Ford tractor is broken down in a field right close to as big as three Wal-Mart Super Center parking lots — or there about. Closer to home, there is an old Chevy truck, a 41 or 42 model, (I can’t be sure, they are very similar), which I have longed to photograph. The old klunker is in plain,unobstructed sight from the Princeton Pine (a.k.a. Arkansas Highway 190) west of Pine Bluff, our spiritual headquarters. Only problem is I can never catch it in the right light or by itself. The owner is in the salvage business and he leans used “for sale” stuff against it, knowing that people will always look in that direction. Official portrait of my favorite 1941 (or 42) Chevrolet bob truck. Got lucky today. The good news was, the stuff was gone. The bad news: the truck was back lit — conditions less than ideal. About the time I was about to mutter under my breath The Master Weatherman sent a cloud between the truck and the sun — which evened the light. Got my shots. Life is good. A three-quarter view of the old truck with a curious horse in the background. By the way, for the uninitiated, “ferrous oxide” is another name for “rust.” Whereas millions of individuals believe that rust and cloudy days are undesirable conditions, we have today proven them wrong and misinformed. 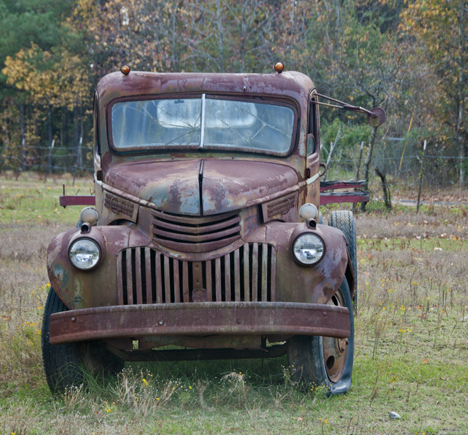 Without rust, our old vehicles would have no aging patina. Without the clouds, we’d have no truck pictures. I rest my case. Descending White Oak Mountain, I happened across this break in the treeline just at the right time. Just after a down-hill hairpin curve, the scene sneaks up on you. It is late afternoon and the sun is just right. With fall foliage, timing is everything and changing leaves are no respecters of available weekend time for interlopers to observe these fickle leaves’ spectacular displays. However the Almighty was smiling my way on this trip. Initially, I doubted these favors as I grumbled to myself under an oppressive overcast. When the overhanging clouds dissolved the muted fall foliage sprang to life. Find out more and get in on the start of this story on the Photo of the Week page at Corndancer dot-com. We’ll wait here while you check it out. Though White Oak Mountain was my ultimate destination for the day, there were other photo-ops to see including a nice mountain stream. Though a bit dry due to our rain deficit, it was nonetheless a pleasant view. Lingering greens and early fall colors are nice. I started the trip to White Oak Mountain in Heber Springs, Arkansas, which sits next to Greers Ferry Lake. 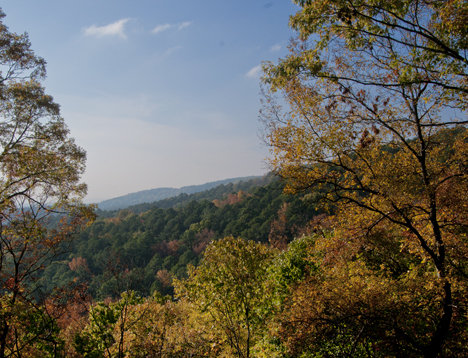 The way to White Oak is via Arkansas Highway 16, one of the best scenic drives in the region. 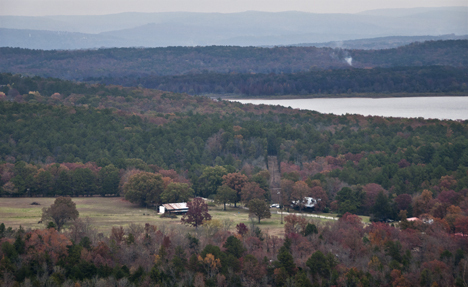 A pull-off area north of Greers Ferry (the town, not the lake), affords this view. I took a stroll across Greers Ferry Dam to shoot down stream. This shot is from the east approach to the dam, looking west. 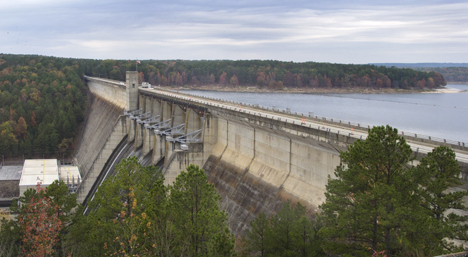 Traffic is limited to one lane on part of the dam to accommodate maintenance. 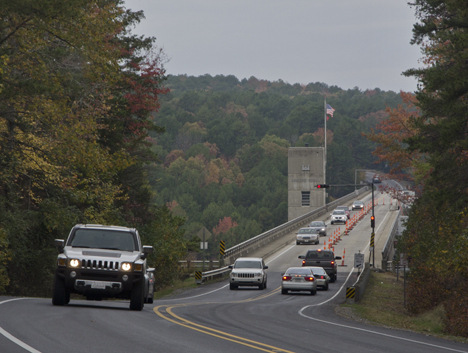 “They” are performing maintenance on Greers Ferry Dam which necessitates sending traffic in one lane. Slower moving traffic afforded me the opprotunity to become a pedestrian on the dam side walk and shoot downstream, something you want to see but something at which you are are reluctant to take a glimpse while driving. Looking down stream on the Little Red River from the top of Greers Ferry Dam. And for my friends who say I don't give a dam, here one is: Greer's Ferry Dam, shot from the observation deck on the east side of the structure. John F. Kennedy dedicated the dam from this spot a week before he was assassinated.